Improved understanding of water risks, of the drivers of poverty, and of institutional constraints is central to the development of policies and practices that aim to achieve and maintain water security for the poor. In an increasingly complex landscape of demographic, climatic, environmental, political and economic change, this requires moving beyond sectoral and disciplinary silos and traditional approaches which isolate drinking water from water resources. Since 2015, the DFID-funded REACH programme has been collaborating with government, practitioner and enterprise stakeholders to improve water security for millions of poor people in Africa and South Asia by delivering world-class science that influences policy and practice. 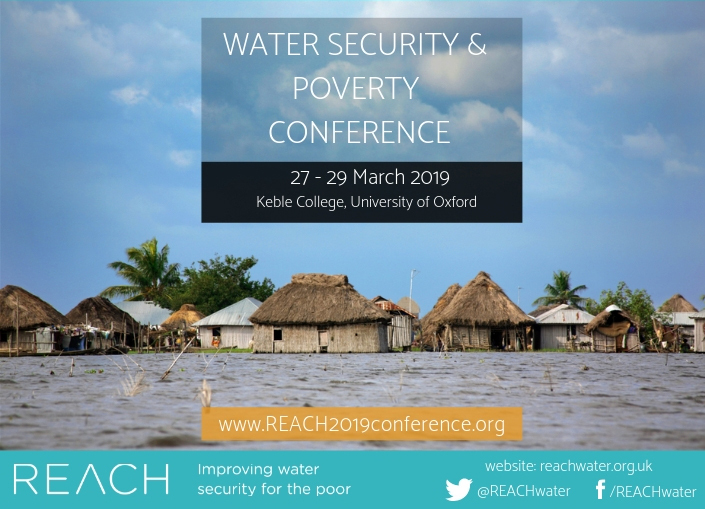 On 27-29 March, REACH’s international conference on Water Security and Poverty will convene leading practitioners and scientists in Oxford to discuss key results to date from REACH in Bangladesh, Kenya and Ethiopia, and continue to shape major academic, policy and practice debates around water security and poverty. Date and time: From 2PM on 27 March to 1PM on 29 March 2019. Please email reach@water.ox.ac.uk if you have any questions.